Enhancements are underway to celebrate the 50th anniversary of Apollo 11. 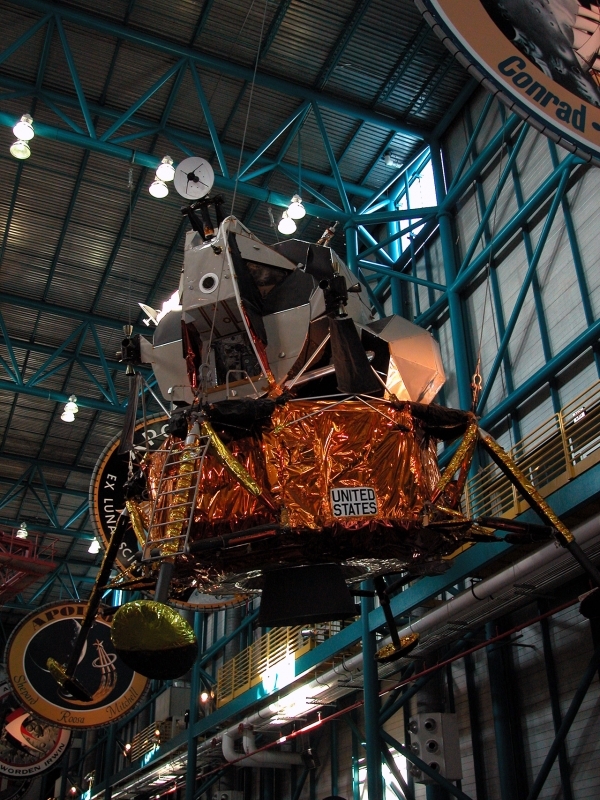 Lunar Module 9 will be displayed under the Saturn V rocket. CAPE CANAVERAL – KENNEDY SPACE CENTER – Lunar Module 9 (LM-9) has “landed” at Kennedy Space Center Visitor Complex’s Apollo/Saturn V Center. This summer, guests will be able to get a closer look at LM-9, one of only three remaining Lunar Modules designed for mission use. Previously suspended from the ceiling, the relocation of the module is part of an initiative to reimagine the Apollo/Saturn V Center as Kennedy Space Center Visitor Complex gears up for the 50th anniversary celebration of Apollo 11. Originally intended to fly on Apollo 15, LM-9 was replaced with an Extended Lunar Module when the Lunar Rover was added to the mission. In 2017, this American relic was completely refurbished to preserve for generations to come. The careful relocation of the historic artifact took place over several hours to ensure its safety. In celebration of the 50th anniversary, visitors to the Apollo/Saturn V Center will be met with a host of additions and enhancements as it is reimagined with a renovated “sense of arrival” that includes revamped landscaping, thematic signage and more, setting a new tone for the experience. At the entrance to the Lunar Theater, guests will be transported back to 1969 as they step into a period living room recreation to experience what it was like to watch the Moon landing. Other enhancements include an enriched Touch the Moon exhibit, a Moon Tree garden, Fisher Space Pen legacy display, a closer look at the CSM-119, and more. The Astrovan, which transported astronauts to the launch pad and can be seen in the movie “First Man,” is also on display at the Apollo/Saturn V Center. To stay up to date on Kennedy Space Center Visitor Complex’s plans to commemorate Apollo 11, visit https://kennedyspacecenter.com/. Kennedy Space Center Visitor Complex brings to life the epic story of the U.S. space program, offering a full day or more of fun, inspiration and educational activities. This includes the Apollo/Saturn V Center, which features an actual Saturn V Moon rocket, and is currently being upgraded and expanded in celebration of the 50th anniversary of the Apollo 11 launch and Moon landing. Also included with admission are Heroes & Legends, featuring the U.S. Astronaut Hall of Fame®, presented by Boeing, the Kennedy Space Center Bus Tour, Space Shuttle Atlantis®, Shuttle Launch Experience®, IMAX® A Beautiful Planet 3D and Journey To Space 3D films, Astronaut Encounter, Journey To Mars: Explorers Wanted, Science on a Sphere®, and the Rocket Garden. Add-on experiences available for an additional fee include the new Astronaut Training Experience® Exploring with Lockheed Martin, Cosmic Quest, Dine With an Astronaut and special interest bus tours. Only 45 minutes from Orlando, Fla., Kennedy Space Center Visitor Complex opens daily at 9 a.m. with closing times varying by season. Admission is $57 + tax for adults and $47 + tax for children ages 3 – 11. Kennedy Space Center Visitor Complex offers annual passes starting at $82 + tax for adults and $67 + tax for children ages 3 – 11. For more information, call 877-313-2610 or visit www.KennedySpaceCenter.com.